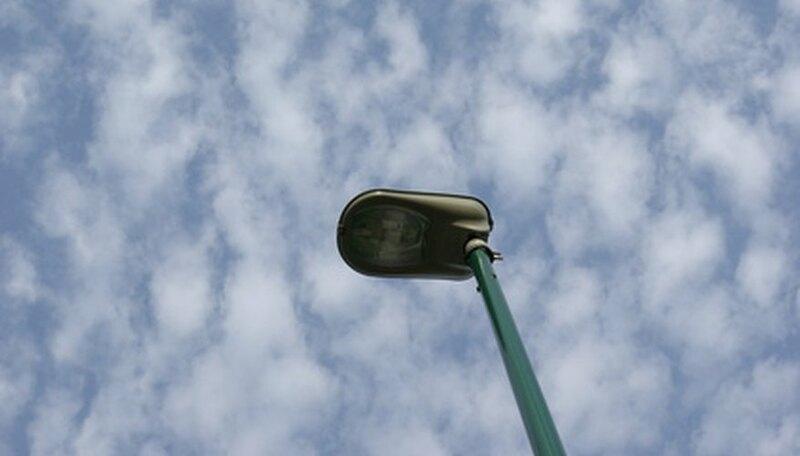 Bases of light poles are circular in shape. Determine the size of the light pole base by calculating its area in square inches. This can be done even if the base of the light pole is inaccessible because the pole is upright. Finding the circumference, or distance around, the base allows determination of the radius and then the area. Radius measures the distance from the center of a circle to its edge. Measure the circumference of the light pole in inches as close to the base as possible. For example, the circumference might be 40 inches. Divide the circumference by 2 times the number pi to get the radius of the base. Use 3.14 for the number pi. Performing this step leads to 40 inches divided by 2 times 3.1415, or 6.28, which equals a radius of 6.4 inches. Multiply the number pi times the square of the radius to obtain the area of the base of the light pole in square inches. Completing this step, you have 3.14 times 6.4 inches times 6.4 inches, or 128.6 square inches. Hirsch, William. "How to Calculate Light Pole Base Size." Sciencing, https://sciencing.com/calculate-light-pole-base-size-7714659.html. 24 April 2017.